Every night local families who are without homes fill the 36 beds Pear Blossom Place, where they live temporarily. Through the winter months, an additional 30 mats are set out in the evenings for sleeping only. Pear Blossom opened in July 2014, and it has operated at it 100 percent capacity ever since. 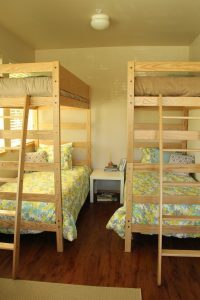 Woodshed Furniture, a family-owned business, is opening its heart and hands to support Pear Blossom Place’s work through the Family Support Center (FSC) by collecting and matching funds for new mattresses. Trish Gregory, executive director of the Family Support Center, said that mattresses are replaced on a regular basis, so new ones are definitely needed. “I became aware of The Family Support Center through the sheriff’s office,” explained Trisha Claridge, whose husband Dave Claridge is a sergeant with the Thurston County Sherriff’s Office. 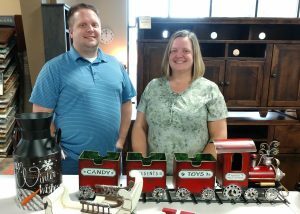 Trisha and her brother Jed Hart own Woodshed Furniture. For the past two years, the store has held a toy drive for FSC, but due to an impending move by FSC, it was decided a mattress drive would work better this season. Customers making a small, suggested donation of $20 or more, will get special discounts on their furniture purchases and funds collected will go to new mattresses for the families at Pear Blossom Place. The Woodshed will also be matching donations collected up to $1,000 to help Pear Blossom Place with other needs. Trisha also noted she appreciates that the families at Pear Blossom Place receive far more than a bed for sleeping. They are involved with intensive case management along with the immediate emergency shelter. There is counseling, mental health support, computer and phone access, food, hygiene supplies, employment assistance, transportation and warm clothes. Families are apprised of available assistance programs. The housing is meant to be temporary with families staying there from several weeks up to six months. People are coached on resume writing and job searching. Parent education classes deal with positive reinforcement of desired behaviors and work with the stresses that accompany homelessness. Stress is a huge issue, as the two most common causes of homelessness are job loss and domestic violence. 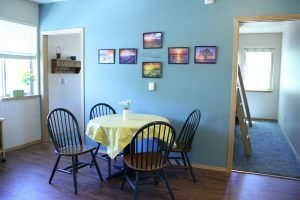 It is important to understand that many family members staying at Pear Blossom Place have some income and others have full time employment, but increasing rental rates and limited housing choices make securing permanent housing a challenge. “I see the value in the work we do,” said Trish Gregory, who has been working with the FSC for the past 18 years. She recalled her deeply felt emotions when families come back years later to express how critical the help was for them. It provides hope and reinforcement that local support services are remarkably impactful. One previously homeless mom and young son stopped by 17 years after getting help. It had been an extremely rough time, and her time with FSC was a turning point. Now she and her son are healthy and have a home. 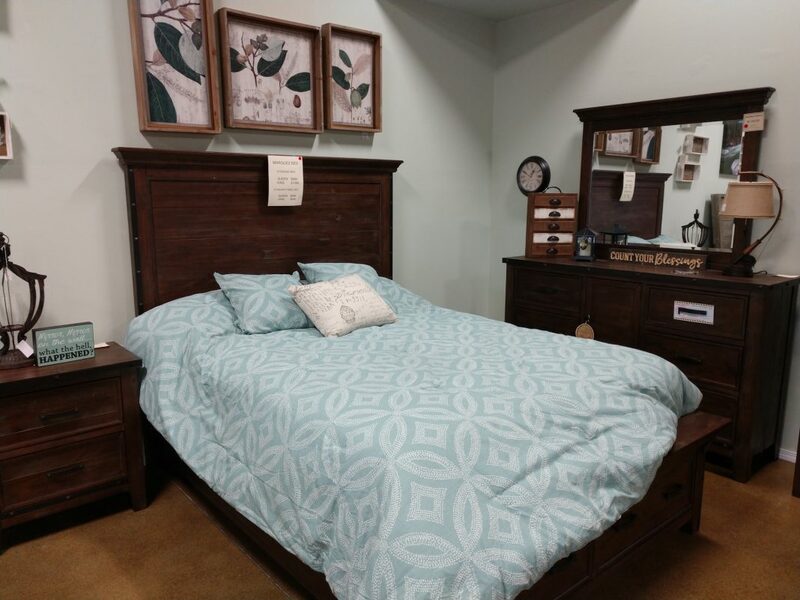 There are special discounts on mattresses and furniture at Woodshed Furniture, but there is much more to see. 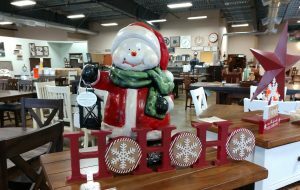 The store is decorated for the holidays and Trisha wants your home to feel comfortable and welcoming for all your family and friends. It’s the time of year when extra people are gathered and you realize it really would be great to have a new couch or relaxing recliner. Trisha and Jed would be delighted to show you the possibilities. The store is closed on Sundays so that all the employees can be with their families. Looking at the attractive pictures on the website is a place to start shopping. When you visit their Lacey location, you will also find a sprawling space adjacent to the main showroom that is filled with mattress and bedding accessories. Some of us are fortunate to have a permanent home with our own bed. Others do not. I would like to imagine it is possible that all the children in our community could be as the Clement Clark Moore’s holiday poem suggests, “The children were nestled all snug in their beds, while visions of sugarplums danced in their heads.” Your donations truly make a difference. If you or someone you know needs emergency housing, call the Family Support Center at 360-754-9297. The Family Support Center has a Ready, Set, Go Closet with interview clothes for women and men. Professional clothing items including shoes may be new or gently used. New pantyhose can be donated. Other adult clothing is not being accepted at this time nor computer equipment or large household furniture.